Ozark Sundrops Primrose is a native plant to our area. It is a mounding perennial that is adorned with yellow fragrant blooms from early summer to late summerl. 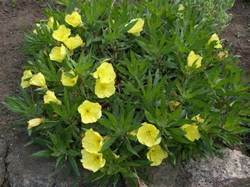 It blooms in the early evening and throughout the night till morning, hence the name 'Evening Primrose'. Lemon Drop is a Plant Select perennial. Ozark Sundrops Primrose will grow to a height of 9-12" and 12" to 18" in width. It has dark green foliage throughout the season. Use Ozark Sundrops Primrose for massing in a perennial bed or as a ground cover. You can even plant this Primrose in a Rock Garden or Moon Garden. Plant in well drained soil in full sunlight as Ozark Sundrops Primrose loves the heat. It is drought tolerant once it is established and is deer resistant and a Firewise plant. Ozark Sundrops Primrose used to be called Missouri Evening Primrose.